The title of this book is pretty indicative of the subject matter. The author succeeds at explaining who Jesus was and is. He teaches that Christ is the focus of the Bible in its entirety. He demonstrates how Jesus is the fulfillment of the prophecies, shadows and types. All of this is done with simple terms when possible. When it is not possible Mr. Friel explains the nomenclature for the laymen. I have to make a small disclaimer here. I am a big fan of, “Wretched Radio.” It is a radio show and podcast. Todd Friel is the host/on-air personality. I have learned a lot, a lot, a lot, from the show over the years. My review will be from the perspective of a Reformed Baptist and a fan of the show. So don’t expect much in the way of negativity. I honestly agree with all of what is said in the book. I find it to be Biblically sound and interesting to read. It is a, “must read” for everybody. If you’ve just been born again or if you’ve been 50 years into the sanctification process this book will edify you. In the first chapter the author deals with world views, specifically post-modernism. This was a great place to start as a philosophy class on epistemology would not be beneficial for the target audience. This is a short chapter that sets the tone for the rest of the book. You get a look at the serious subject matter and a look at some of Todd’s humor that makes him such an interesting fellow to listen to. It is obvious that he has a level of mastery of the subject matter without coming off as an aloof overlord. The following chapters flesh out some basics of Christian theology in simple terms. Then he gets down to the bulk of the work, which is highlighting Christ from the beginning of the Bible to the end. Vary rarely in Christian books of around 200 pages do we get such a complete and profound picture of Jesus. Most of the books I’ve reviewed in the recent past have been theological fluff, Christian cotton candy, hardly worth reading at all. You know how you feel after eating junk for a month? Yep! That’s how most “Christian books” leave me feeling after reading them. They were time killers with not nutritional value. I probably would have got more out of them if I’d eaten them. Well, that is not so of this work. I would rank it up there with, “The Holiness of God” by R. C. Sproul, or maybe, “Crazy Love” by Francis Chan. 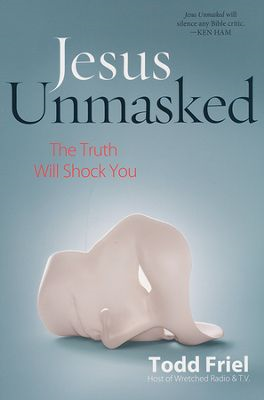 The main way that the author highlights Christ throughout the entire Bible is by expounding on the prophecies, shadows, and types, that Jesus fulfills. This can be a bit tricky. I’ve seen some pretty bad attempts that only make the Bible look disjunct. When done correctly, as in this case, the Bible comes alive. The harmony of scripture sings to the heart and mind of the believer who sees the richness and majesty of the true faith established once and for all by God. Being able to see the ark Noah built and understand that it is a look forward to Jesus. Seeing the rock that sprang forth lifesaving water in the desert for the Israelites, and how Jesus is the better fount. Seeing the Sabbath, from our perspective, looking back to recognize rest in Christ’s work. These and many more examples fill the pages of this book. The gospel is fleshed out fully and explicitly. You won’t find a list of, “do’s” to check off, and you won’t find some silly, formulaic, “pray this prayer.” You will understand who Jesus is, what you are, what He has done, and how you should respond. If you have loved ones who aren’t saved, get them this book. If you have friends or family who are young in their faith, get them this book. If you have become a crusty old codger, get yourself this book. It will blow the carbon out of the old exhaust and get you fired up again. You can buy this book from the wretched store. or you can get it on Amazon in different formats including audio.